SKU: WS344-9X12. Categories: Celebrity, Funny Signs, Novelty Signs, Warning Signs. Tags: gangster, mafia, mob, mob boss, mobster, Warning Signs. 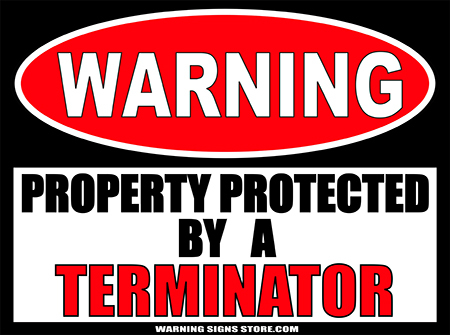 With famous Mobsters like John Joseph Gotti, Jr, Paul Castellano, Al Capone, and Whitey Bulgar, this Warning Sign is sure to make people nervous about stepping on your property. Not only are mobsters knows as dangerous criminals, they’re ORGANIZED dangerous criminals. Which makes them even more dangerous! 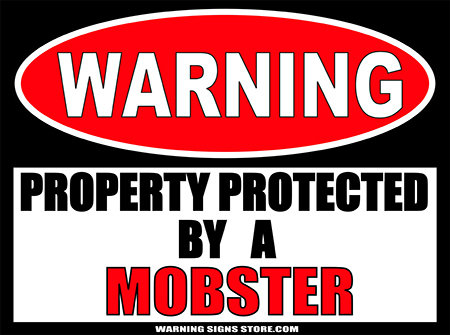 Whether they’re Italian, Irish, Russian, or Asian, mobsters are great at protecting their property! And people will assume they’re going to be just as good at protecting yours! This Property Protected by a Mobster sticker measures out to approximately 9″ x 12″. It is printed in a glossy finish with eco-friendly inks on a premium vinyl polymer. Our inks are UV resistant and designed to last 7-10 years, indoors or out.